Due to under harvesting and a growing population, we are now offering a limited number of early fall black bear hunts. These hunts take place in September and include archery, muzzleloader, and rifle. Contact us for specific dates. Archery and muzzleloader tags are over the counter with caps and limited rifle tags are through the draw and take one preference point. Bears in the area range in size from 200 pound juveniles to mature adults over 400 pounds in a variety of color phases, including black, chocolate, cinnamon, blonde, and a mixture of all. We pursue these bruins using two methods; ground blind hunting over a carcass, and calling. The only thing predictable about a black bear is that they are unpredictable. Most will avoid humans at all cost, but some have no fear. Caution and respect should always be exercised. During the fall before the snow flies, bears are on a feeding frenzy eating everything they can find to store up fat in preparation for the winter hibernation. 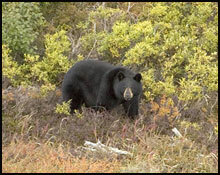 Black bear are predominantly omnivorous, feeding on a variety of plants, grasses and berries, but being the opportunist they are, they will also feed on carrion and carcasses. This is a very smelly situation, but also very productive. We hunt from ground blinds twenty to fifty feet from a carcass waiting for a bear to sneak in for an easy meal. When he comes in you won’t have a clue he’s there until he’s right there. Up close and personal, you’ll be close enough to smell him, and you will…. Calling is the most exciting way to hunt them – as well as the most dangerous. Becoming the bait yourself is a way to experience a rush like no other. A bear’s hearing is phenomenal, its sense of smell outstanding, and contrary to most beliefs they have pretty good eyesight, so working the wind and keeping movement to a minimum is critical. Bears can lose interest quickly, so calling requires patience and persistence, and it can take an hour or more for a big bruin to show himself, but when he does, be ready, because he’s coming in for dinner!!! Black bear are hard to kill, and harder to track when wounded, and nothing is more unnerving than going into the thick brush after a wounded bear. Blood goes into the fat between hide and meat and their thick fur absorbs external blood like a sponge. They do not go down easily, and will fight until they die. For this reason accurate shot placement is critical to put them down. With bow or firearms the kill spot is a 4-5 inch area behind the front shoulder and follow up shots if possible are essential. These guided hunts take place on horseback from our Castle Creek Camp. 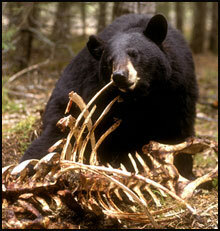 If you’re looking for a great black bear hunt in a low hunting pressured area give us a try. 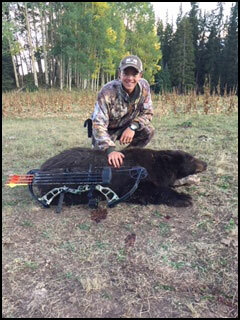 Black bear populations are healthy throughout the Gunnison Basin, and CPW encourages hunters to try their hand at pursuing the native bruin. Those who harvest a bear must personally present the carcass for inspection and sealing at a CPW office within five working days of harvest, where an agency staff will remove a premolar tooth for research purposes.